Was it a catch? 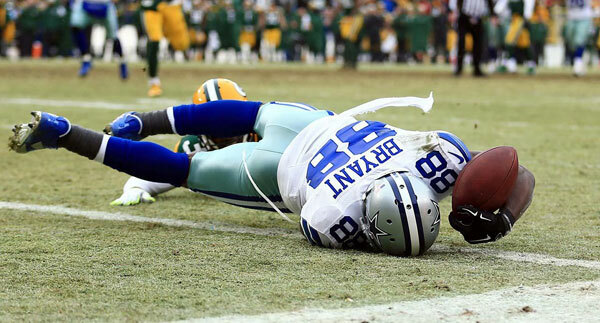 Dez Bryant made one of the season's best catches to set up a would-be Dallas touchdown opportunity late in the fourth quarter against Green Bay, only to see the call overturned and the Cowboys' season come to a sudden end. The play left New Jersey governor (and Dallas superfan) Chris Chistie stunned, Wisconsin Rep. Paul Ryan ecstatic and Lions players tweeting about karma. Other highlights from the NFL weekend: Aaron Rodgers gave millions of fantasy owners a team name for next season (New York Bozo) ... Tony Romo throws with his eyes closed ... The Cowboys and Packers had a mid-game brawl ... Peyton Manning had a bad day throwing the ball, which inspired a bunch of noodle-arm memes ... ESPN's experts all whiffed on the Colts-Broncos game ... Marshawn Lynch gave the media another stiff-arm after Seattle's victory, though he had plenty to say on this Kam Chancellor interception return ... Speaking of Chancellor, he is a freak ... Tom Brady was especially chippy after being kneed by Ravens LB Pernell McPhee ... John Harbaugh is still fuming about the Patriots' offensive line strategies. He should recognize that Bill Belichick is a genius. Julian Edelman isn't so dumb either as he had t-shirts for sale within 24 hours of his memorable trick play touchdown pass. But nothing beat Hannah Storm delivering a stiff-arm to her makeup artist. A positional breakdown of tonight's championship game and a look at potential X-factors ... Ohio State has new Beats by Dre Headphones courtesy of LeBron James. And to make sure nothing shady was going on, Oregon players received them too ... If you're not sure who to root for, this video of Buckeyes players with the Studebaker Brothers (who both have Duchenne muscular dystrophy) may swing your allegiance ... One Oregon player (offensive lineman Stetzon Bair) is expecting his first child any second now but made the trip to Dallas... Cardale Jones busted out a great mama joke at the OSU press conference ... OSU receivers have matching "Zone 6" necklaces ... A grocery store chain with locations in Columbus is stocking up on Ducks. The 14th annual No Pants Subway Ride took place on Sunday. Check out how the world celebrated this important event. Ana Cheri has some new 2015 calendars out and maybe if I make her LLOD she'll send me a few for a give away (click here for full-size gallery). Rowdy fans got into an enormous chair-throwing brawl during the Darts Invitational Challenge in Melbourne on Saturday. Police are looking at footage to see what sparked the craziness, but an Etihad Stadium spokesman noted that the venue served only mid-strength beer and closed the bar as soon as the violence erupted. Also, I like the expression "mid-strength beer." Can't say enough good things about Will Privette, who didn't let a wheelchair stop him from storming the court after N.C. State's victory over Duke. Privette famously stormed the court in 2013 and ended up being carried to safety by Wolfpack forward C.J. Leslie. A bunch of Dartmouth athletes have been accused of cheating in an Ethics class ... Teemu Selanne became the first member of the Anaheim Ducks to have his number retired ... The UConn women held a 65-9 lead in the second half of their 87-28 victory over SMU ... Catcher Ryan Lavarnway has been released by four teams in less than two months ... A Star Wars fan designed soccer kits for the movie's main characters ... Orioles outfielder Adam Jones lost a $5,000 bet to David Ortiz on Saturday's Ravens-Patriots game. The money will go to charity ... Kentucky-Texas A&M game > Andy Griffith rerun ... 61 great Closed-Caption fails ... This dog ate $23,000 worth of wedding rings ... This woman has the largest implants in the world. A 4-year-old Cavs fan recited the Cavs starting lineup. Seahawks superfan Rainn Wilson, who played Dwight Schrute in The Office, makes fun of the Panthers. The duo roasted just about everyone in their Golden Globe monologue last night. I thought the George Clooney joke was their best. The Foo Fighters played a surprise concert in L.A. on Saturday for Dave Grohl's 46th birthday. Among the highlights were David Lee Roth joining the band for my favorite Van Halen song.